While Emmy was sleeping off her sea sickness I made a quick excursion to a waterfall about a kilometre away on the hill above Furneaux Lodge. Well… it was supposed to be quick, but the path was difficult and ultimately it took me about three hours to walk to the falls and back. But it was worth it. The bush was largely (but not completely) pristine native bush. There were tangled skeins of black, woody, supplejack vines (kareao in Maori). 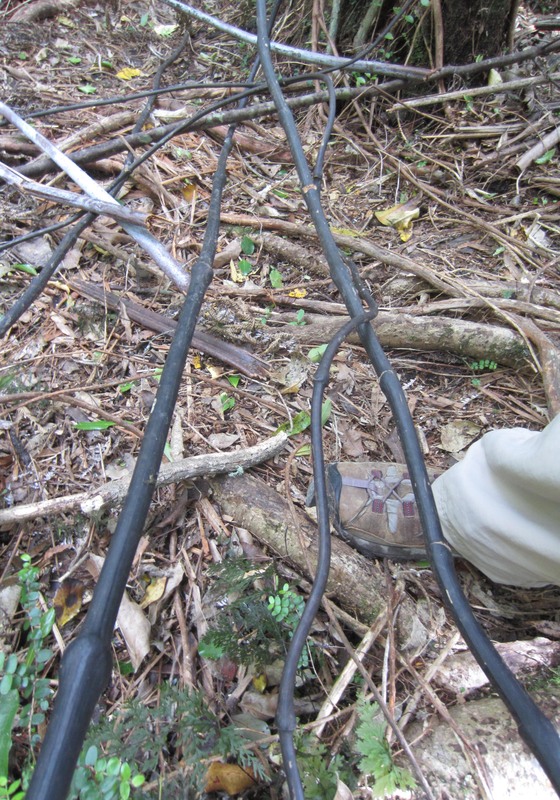 In some places they lay on the ground like electric power cables waiting for a walker’s boot to trip over them. It was these vines that in childhood my friends and I prized above all plants. If we found a suitable one we made it into a tough bow and fitted arrows to it made from straight stalks of bracken. Supplejack vines lie across the path like electric cables. 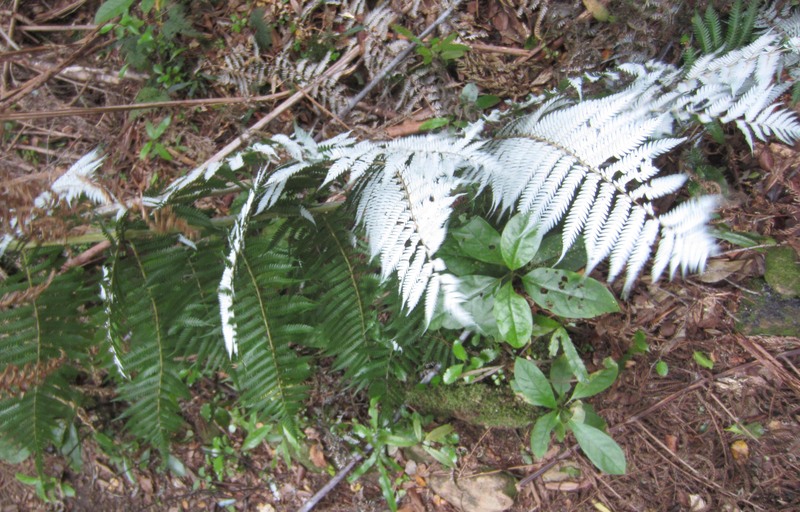 Everywhere there were thickets of silver fern (ponga) with fronds that were green on the upper surface and silvery white underneath. These are the plants that – besides the kiwi – have become an almost universal symbol of the New Zealand nation, decorating the playing jersies of the god-like All Blacks in particular. 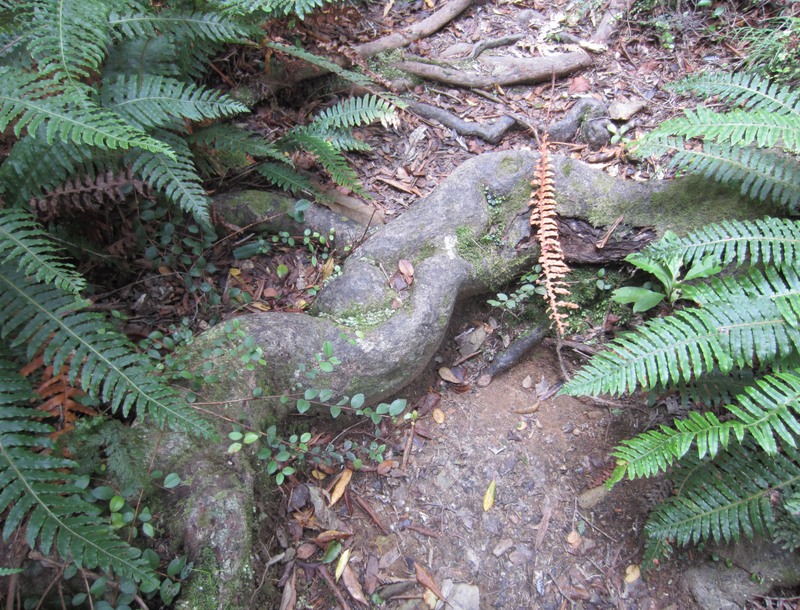 But the ferns are not mere mythic symbols, they really exist, and here they are abundant. Green on top, silver underneath. 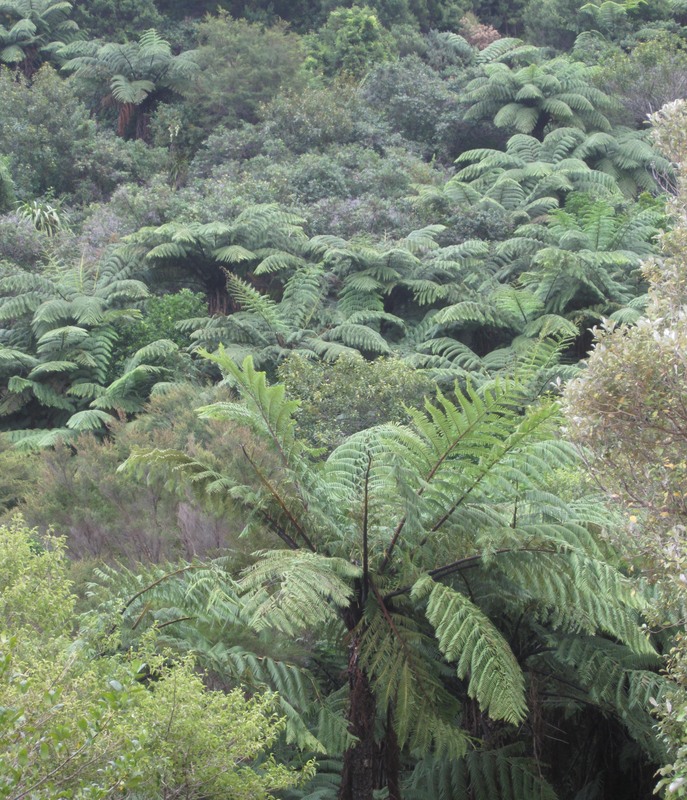 New Zealand's famed silver fern. 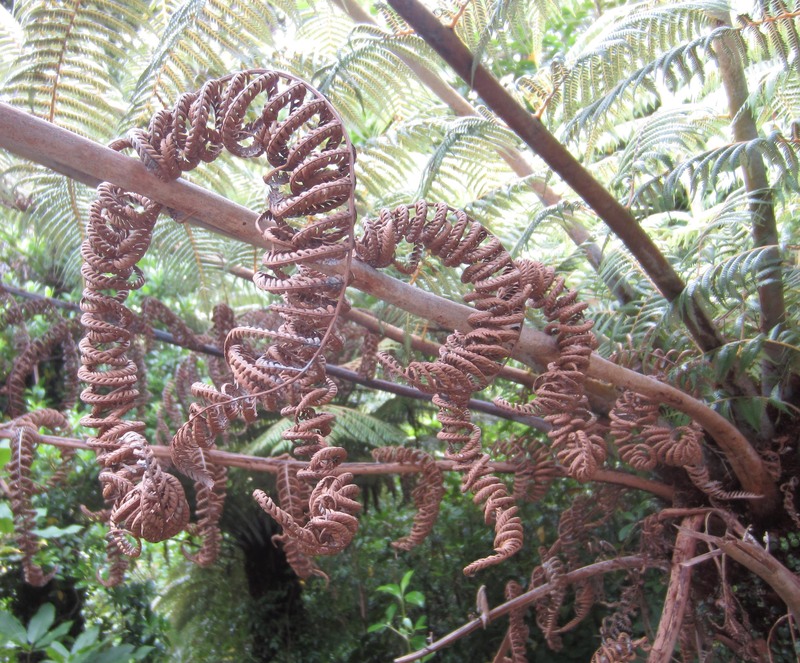 Dry fern fronds hang like exotic necklaces. 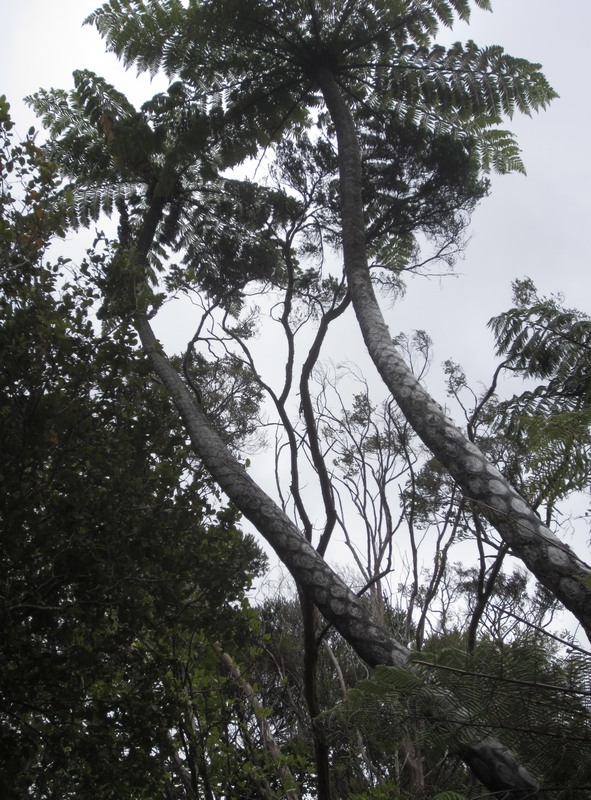 There were spindly, black-trunked tree ferns (mamaku), many rising as high as coconut trees. In places they stood in dense clusters with whorls of foliage overlapping in lush profusion as in a prehistoric forest. 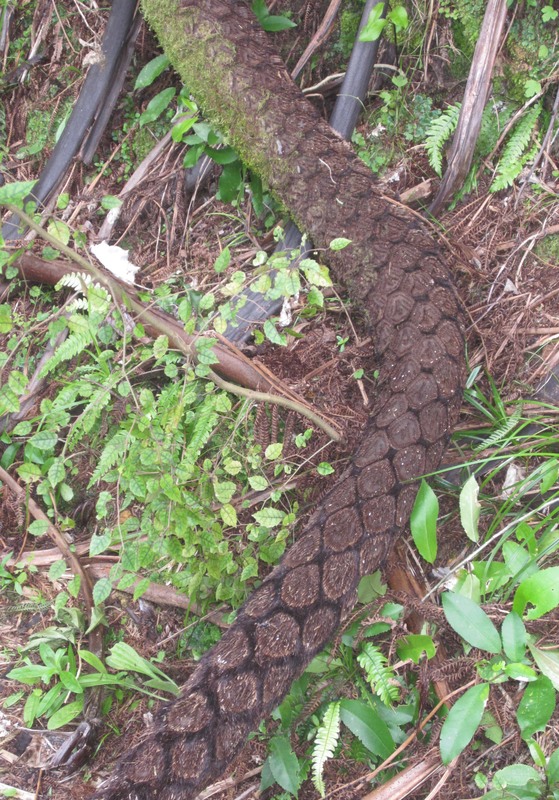 Here and there a mamaku had crashed to the ground, the hexagonal markings on its trunk like the scales of some eerie black python. Mamaku ferns stand as tall as tropical coconut palms. Prehistoric forest habitat... once inhabited by the three-metre tall moa? Like a scaly fossilised python, a fallen ponga trunk stretches out across our path. Tea tree (manuka) shrubs were prolific, some forming tunnels of grey trunks and grey vegetation over the path. A few displayed the small white flowers that produce New Zealand’s famed manuka honey. Manuka honey is said to have anti-microbial properties. It is effective as an antiseptic on skin lesions. My favourite toothpaste is New Zealand-made Red Seal Propolis toothpaste infused with honey extract (though I’m not sure whether the extract is manuka honey). The packaging claims it sweetens the breath and keeps gums in good shape, and I think it does. 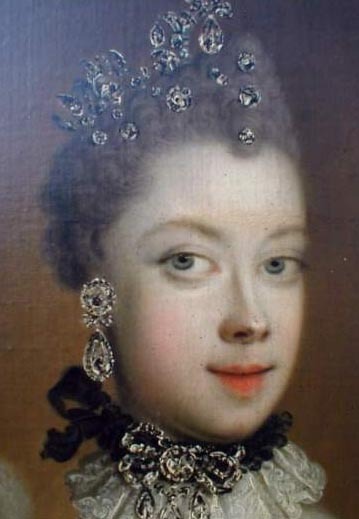 Queen Charlotte (before she had her 15 children, presumably). Wikipedia image.. The next day, Friday March 9th, Emmy bravely hoisted a backpack on to her back and we set off on the 14 kilometre segment to our next stop, Mahana Lodge at Punga Cove. 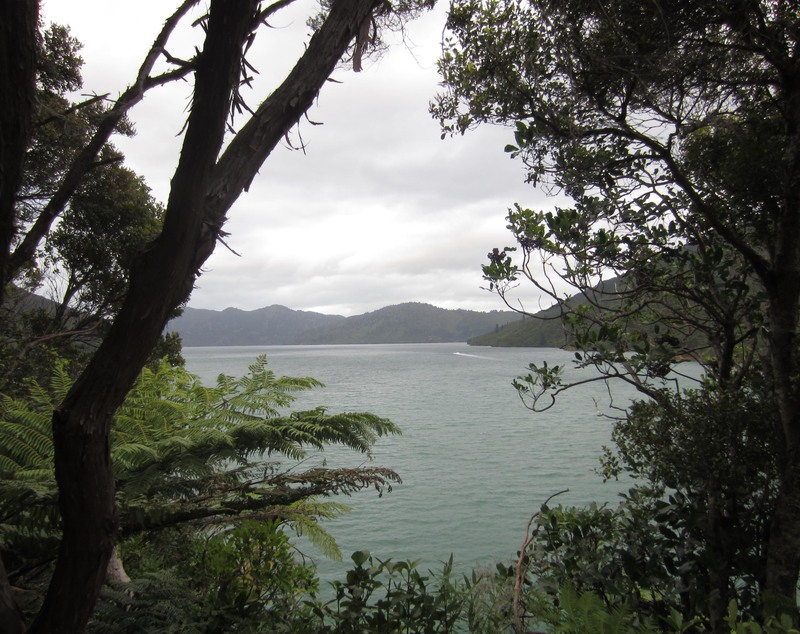 The track took us around the densely forested shoreline of Endeavour Inlet, named after the ship captained by James Cook when he “discovered” and named Queen Charlotte Sound in 1770 (he stopped by again in 1777). By the way, Queen Charlotte was the German-born wife of King George the third who ruled the United Kingdom from 1760 to 1820. Queen Charlotte gave birth to 15 children and stoically tolerated her husband’s bouts of insanity made famous in Alan Bennett’s play The Madness of King George III (which Emmy and I saw in Bath, England, last year – great show!). Of course, there is a bizarre disconnect between a wild and beautiful arm of water in one of the world’s most remote archipelagos, and a king’s consort who patronised Mozart and Handel in her salons at Buckingham Palace. But history has a habit of smoothing out the jolt of these disconnects and today nobody thinks twice about the powdered, bewigged and bejewelled lady whose haughty face stands behind the name of the sound. On the track between Furneaux Lodge and Mahana Lodge: a view over Endeavour Inlet. Fourteen kilometres is not a long stretch but we took it slowly. It was around 3.00 pm when we ambled in to Mahana Lodge (41° 7’52.40″S, 174° 9’14.36″E, see http://www.mahanalodge.co.nz/) to a wonderfully warm welcome from our hostess, Ann Martin. She conducted us to our accommodation, a comfortable cabin behind the main buildings of the lodge. We stretched out on the comfortable bed. On the opposite wall a window looked into a profusion of branches and leaves alive with tiny birds. Around us the forest buzzed and hissed and clicked in the late afternoon warmth. We soon sank into a deep sleep. 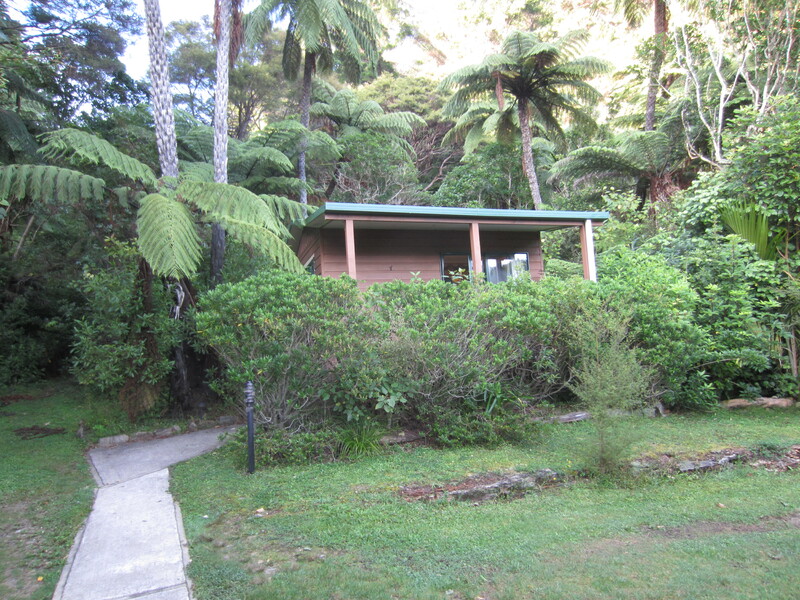 Our bush-clad accommodation at Mahana Lodge. 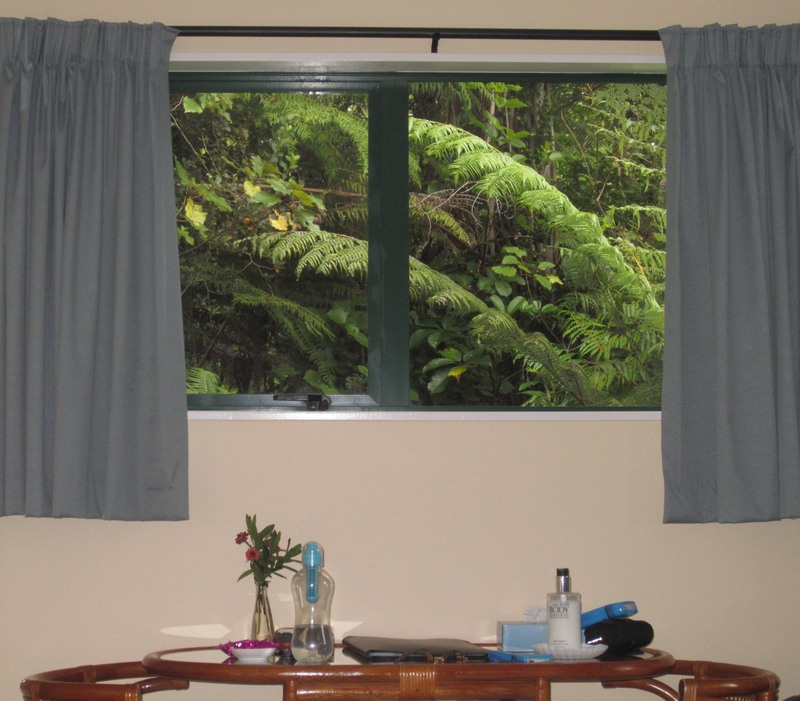 Much better than TV: our personal window into the bird-filled bush at Mahana Lodge. 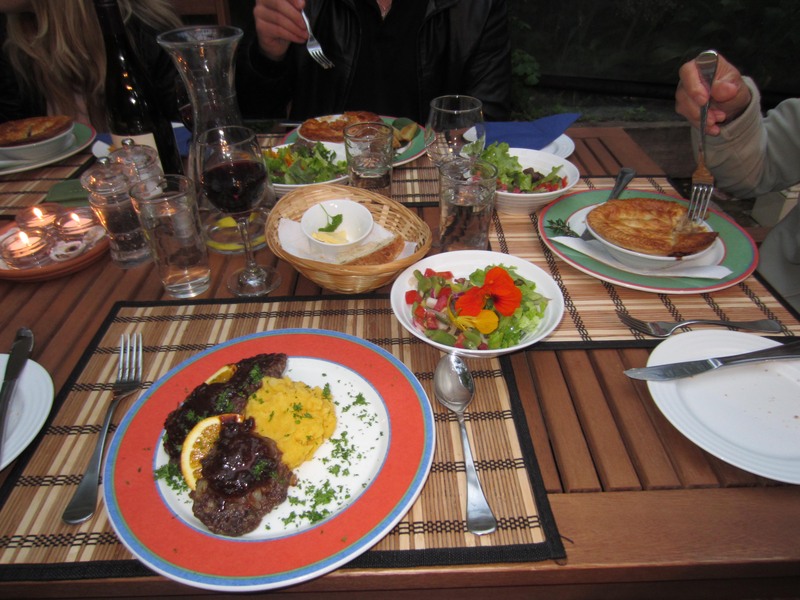 Dinner was served at 7.00 p.m. in the fading light of early evening. The lodge’s ten guests assembled around a long table in a semi-outdoor garden conservatory. John Martin put on a spectacular display of culinary magic, all home-cooked and (mostly) home grown. I had flavoursome venison patties served on a bed of sweet potato (kumara) mash. Emmy (her appetite suddenly reawakened) tucked into a crispy home-baked chicken and mushroom pie. The side dishes of juicy salad – pulled straight from John’s garden just minutes before – were garnished with the mild, delicious bite of bright red nasturtium petals. Home baked bread and a caraf of Marlborough pinot noir kept the conversation flowing well past nightfall. 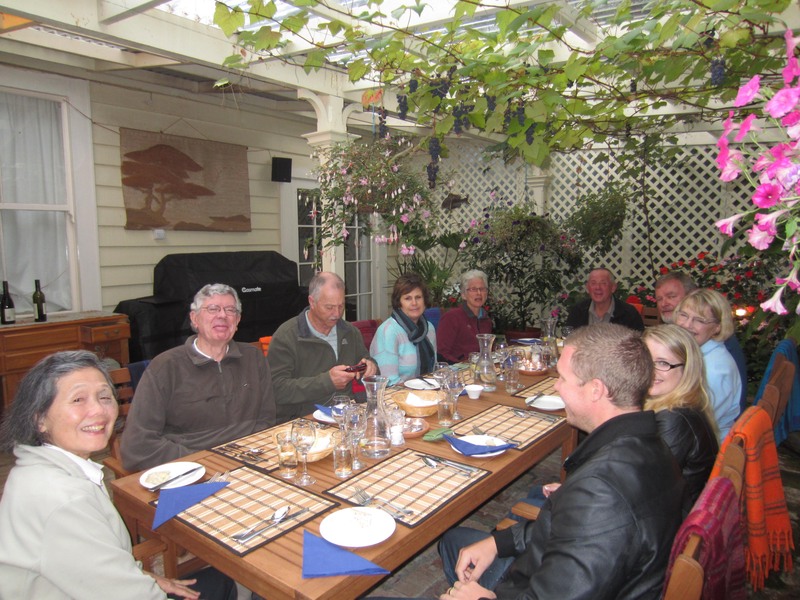 Walkers seated for dinner at Mahana Lodge. Venison patties on kumara mash with (right) chicken and mushroom pie and (centre) nasturtium-decorated salads: our delicious meal at Mahana Lodge. The following morning, as we checked out, Emmy asked Ann about a mystery that had made her look around nervously the previous night. A weka? I had a vague memory of a small, fat, flightless bird. Later in the day we were to see more – much more – of these endearing but kleptomaniac little creatures. This entry was posted in Queen Charlotte Track and tagged hiking, long distance walking, New Zealand, Queen Charlotte Sound, tramping by George Quinn. Bookmark the permalink.